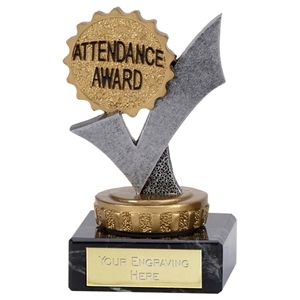 Attendance Trophies with Free Engraving Browse our attendance awards here. Is your school in need of some quality, affordable attendance trophies? Whether you’re a primary school, secondary, grammar or private school, an attendance award is a great way to praise students for their perfect attendance and recognition of commitment to their education. Here at Aford Awards, we have been supplying trophies, medals, plaques and cups for nearly 40 years. We have worked with the likes of clubs, schools, festival and tournament organisation to provide some of the best trophies across the UK. During our time as one of the UK’s leading trophy supplier’s we have built a firm reputation as a valuable supplier offering excellent customer service and quality products at the best possible prices. Some of our clients include BT Sport, Subway, Chelsea Football Club and the BBC just to name a few. We love working with new businesses and clients, however big or small. If you have an award in mind, but can’t see what you’re looking for online, check out our bespoke trophy page or get in touch and we’ll discuss your trophy with you. We offer a variety of attendance awards in different designs and styles for all different types of occasions. Our attendance trophies are suitable for schools where a celebration evening or an awards event is being held. Whether you opt for our Mini Star Attendance Trophy for your 100% attendance students at nursery or primary school or our Attendance Mini Shield for your secondary or grammar school celebration, our online trophy store has everything you need to make your awards ceremony a success. In addition to our range of attendance awards for schools we also offer School Achievement trophies and medals, Graduation trophies, House Awards, School Badges and Sport Day awards. Each of our attendance awards are made from the highest quality materials, to ensure your trophy continues to look great year after year. What’s more, we want to ensure you receive a trophy you’re proud of and want to show off to your loved ones. Our perfect attendance awards come with a free personalised school or club badge and additional text if required. We are committed to offering awards at the best possible prices, that’s why we take it upon ourselves to constantly monitor our prices as well as the market to ensure you get the best deal. If we’re slow off the ball to find a price drop, you can still ensure you can get the best price through Aford Award using our Price Promise scheme. The scheme means if you find an identical trophy, medal, cup or plaque anywhere else on the market, we won’t just match the price, we will also reduce the cost by 5%. For more information on our scheme, please visit our Price Promise page. We are proud to offer a FREE engraving service with any of our trophies purchased through our online store. Whether you’re looking to add your own text and/or logo you can do so with any award free of charge. In addition to this, we also offer a premium engraving service which allows your to customise your personal belongings. From watches, jewellery, lighters to tableware, add a touch of personalisation to your valuables! Find out more about our personalised trophies here. If you’re interested in any of the products or services we have to offer, please feel free to get in touch – you can contact us online via our online contact form or you can get in touch on 01622 738711. Whatever you need, one of our helpful team members will always be available to help. Alternatively, if you’re looking for other trophies or medals related to schools or sports, check out our Sports Trophies page or our Schools Trophies page – you’ll find everything from football trophies, Victory medals to dance trophies.